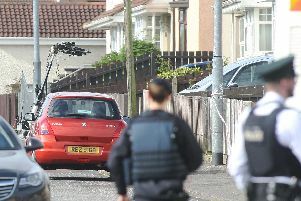 Four men have been taken to Antrim for questioning after police investigating dissident republican activity stopped a car in the Hazelbank area of Londonderry on Thursday, September 24. Detective Inspector Jenna Fitzpatrick said: “Detectives from Serious Crime Branch investigating dissident terrorist activity have arrested four men in Derry. “The men, aged 38, 42, 45 and 46 were arrested after a car was stopped in the Ringfort Road area last night, Thursday, 24 September. “The suspects have been taken to Antrim Serious Crime Suite for questioning.